"Jai Mahal Palace, one of the best luxury heritage hotels in Jaipur, is a magnificent property that is a wonderful Indo-Saracenic architecture. 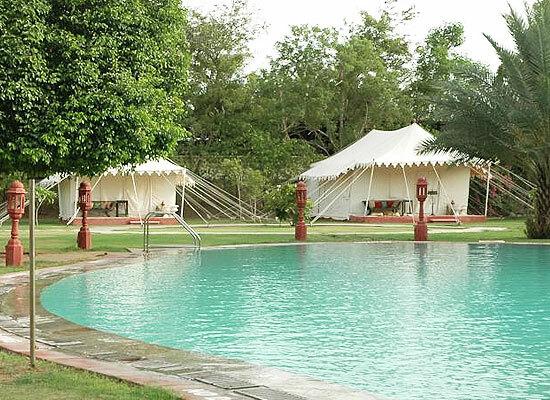 Placed amid 18 acres of landscaped Mughal-style garden, this heritage hotel was originally the residence of the 3 Prime Ministers of the royal Jaipur state. 94 rooms and 6 suites come laden with all the modern comforts and offer stunning views. The interiors are opulent and mesmerizing. Enjoy relaxing sessions at the on-site Spa. Sumptuous food and finest of spirits are served the different in-house restaurants and bars. There are expansive wedding and business spaces too. Spread in an area of 18 acres of well-maintained Mughal gardens, Jai Mahal Palace is a wonderful specimen of Indo-Saracenic architecture. The property was constructed way back in the year 1745 and has been home to 3 Prime Ministers of the Jaipur State. A warehouse of the history of Rajasthan, it has been restored as a luxury heritage hotel in Jaipur wherein modern comforts were added to it. Offering stunning city view, the Deluxe rooms come with 1 king-size bed. The room spreads in an area of 301 square feet. 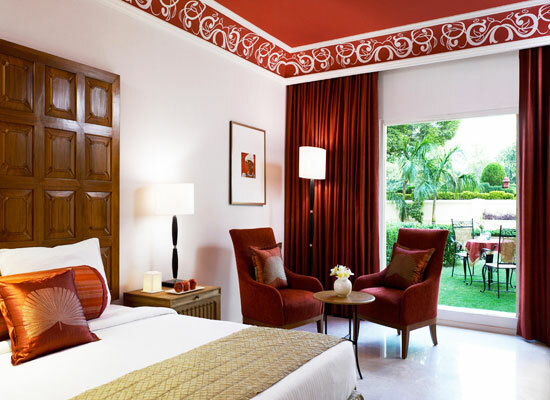 Experience traditional Rajasthani décor in these luxuriously appointed rooms. Original miniature paintings by popular Indian artists are the highlights. 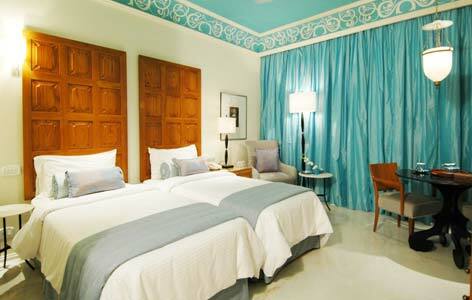 Spread in an area of 377 square feet, the Luxury rooms offer an option of twin beds or a king-size bed. Savor the views of the garden, swimming pool or the city. The color palette is royal turquoise and red with contemporary facilities.The attached bathrooms are equally plush and with sunken bathtubs and shower cubicles. Offering an option between 1 king-size bed or twin beds, the Luxury Rooms with private sit outs that come with views of the lawn or the pool. The rooms spread in an area of 377 square feet and feature all kinds of modern comforts. Covering an area of 1086 square feet, the spacious Topaz Suite comes with a huge king-size bed and offers wonderful view of the city. 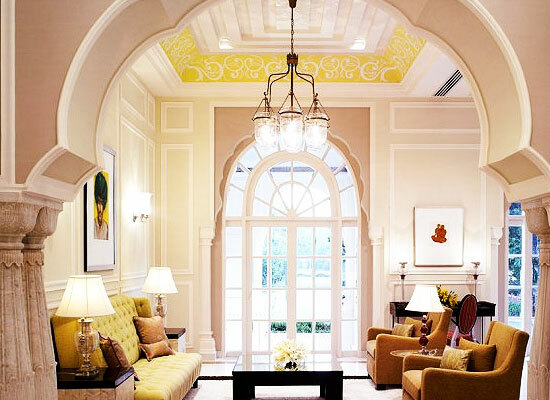 Palatial arched windows are the specialty. Shining topaz hues on the walls is decorated by Rajputana artefacts, creating a warm atmosphere. Featuring beautiful light covered with stained-glass ceiling, the Gangaur Suite’s entrance is guarded by 2 life-size antique Gangaur dolls. The suite spreads in an area of 1246 square feet and offers clear city views. Enjoy a good night’s sleep on a comfortable king-size bed. Spread in an area of 657 square feet, the Junior Suite is a luxurious capacious executive-size suite that comes with traditional flooring and décor. Enjoy the view of the bustling city from your room. The suite features a king-size bed, marble flooring and granite detailing. Offering 2 queen- size beds, the Crystal Suite covers an area of 1,287 square feet and has wonderful views of the city. Traditional detailing is one of the highlights. A pair of stunning antique crystal-framed mirrors add to the old-world charm. A tribute to the architect of the beautiful Jaipur city, the Jaipur Suite comes in rich pinks and blues shades. The suite covers an area of 919 square feet, comes with a king-size bed and offers wonderful views of the city. Covering a huge area of 1,116 square feet, the Peacock Suite has a vivid, colorful suite that is inspired from the beautiful peacock bird. The suite comes with vintage peacock chairs, splendid comfortable king-size bed and a city view. Cinnamon is a pan-Indian restaurant that is a blend of traditional and contemporary. 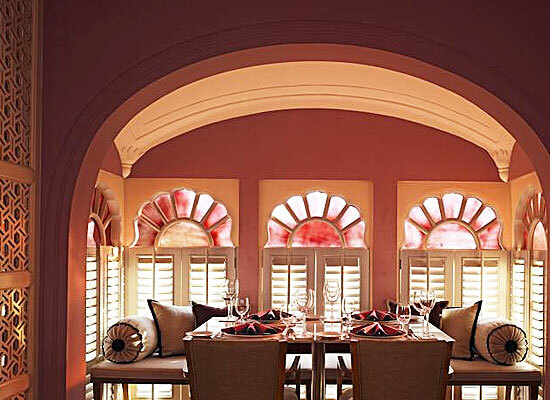 This dining venue has an elegant décor and a regal Rajput architecture. This place originally was the dining room of the Prime Minister of Jaipur State. This fine-dining venue serves delicacies from Rajputana, Awadh, Hyderabad and Kashmir, the four Indian princely states. Placed beside the poolside, in a red brick courtyard, Giardino is the wonderful open-air restaurant where the guests can savor lip-smacking Italian fare. Enjoy a typical Italian meal with al-fresco dining, with the hotel’s well-maintained garden in the background. Herbs used are home-grown. The menu also has a fine collection of wines. Marble Arch is the multi-cuisine fine dining restaurant that also serves seasonal local fare. In the original times it was a capacious open living room. This all-day restaurant has a contemporary setting. On the menu are Indian, European, and Oriental fares. Marigold Bar is a chic and fashionable well-stocked bar with a wide assortment of international and Indian liquor, wines and other beverages. Choose your favorite finger food with your drink. The bar also has a selection of single malts and cigars. The bartenders can also make up an innovative cocktail for you. At La Patisserie, the on-site bakery, relish freshly baked, delightful pastries, breads and cakes. The ambiance is lively and light. There is vast variety of cookies, cakes, chocolates and pastries. The menu also includes of espresso and single-estate coffees along with Assam, organic, fruit, Nilgiri, Darjeeling and herbal teas, from around the world. Oasis is an informal outdoor restaurant, beside the pool, ideal for refreshments and light snacks with drinks. After taking a dip in the outdoor pool, enjoy drinks and food here. The Pink City of India, Jaipur is home to several tourist attractions including the 18th century Jantar Mantar, the Nahargarh Fort, Diwan-E-Am and Diwan-E-Khas, Govind Dev Ji Temple, Hawa Mahal, the Birla Planetarium, Sisodia Rani Ka Bagh, the Vidyadhar Gardens, etc that are worth a visit.